We'll be happy to answer your questions about our organization! As an all volunteer support organization for the nature preserve, we are most easily reached via e-mail. One of our board members will respond to your message as soon as possible. 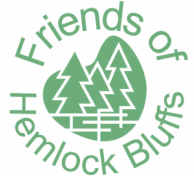 We've tried to include as much information about the Friends of Hemlock Bluffs as possible on this website, if you see that we have not included information about the organization that you wish to know more about, please feel free to contact us. Thank you! The staff at Hemlock Bluffs Nature Preserve manage all aspects of the operations at the nature preserve from gate opening and closing, parking, trails, hiking and group use - as well as all nature programming and natural resource management. Due to limited staffing and decreased hours of operation, we suggest that you visit the website provided by the Town of Cary which provides information on Hemlock Bluffs Nature Preserve. Staff have gathered a wealth of information to provide you with most everything you will need to know prior to your visit. ​Stevens Nature Center by calling (919)387-5980.